Abstract A child is brought to a remote area nursing clinic by his mother. He appears acutely unwell, is crying and scratching his head through matted hair – he has impetigo as a result of head lice. This case report describes the comprehensive wound management considerations to reduce the risk of rheumatic heart disease or renal disease secondary to infection with Group A beta-haemolytic streptococci (GAS). There is an extremely high incidence of impetigo secondary to scabies and head louse infestations in Northern Territory communities. 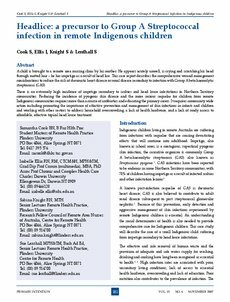 Reducing the incidence of pyogenic skin disease and the more serious sequelae for children from remote Indigenous communities requires more than a course of antibiotics and educating the primary carers. It requires community wide action including promoting the importance of effective prevention and management of skin infections in infants and children and working with other sectors to address household overcrowding, a lack of health hardware, and a lack of ready access to affordable, effective topical head louse treatment.